Over the weekend I was doing some industry analysis for a client. She had a great idea and a novel one at that. Well it turns out that there was one other company in the same niche. A direct competitor…that has the early mover advantage. So what do you do when your the new kid on the block? Like anything else, with lots of hard work and a great deal of luck. 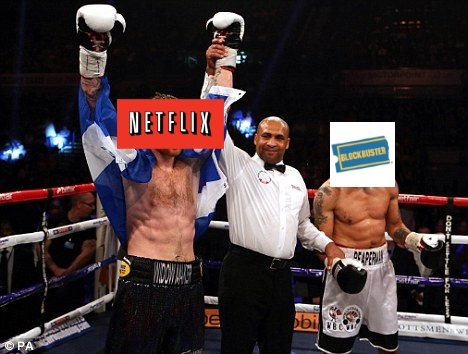 Let’s look at the case of Netflix vs. Blockbuster for guidance. Competitive Advantage – Netflix’s algorithm takes user ratings on movies they rented and then make (i.e. compute) recommendations for other films that they might like, including movies that the viewer may have never heard of. This rating based recommendation is very common-place now (seen everywhere from Pandora to Amazon), but in 1997, Netflix’s algorithm was a competitive advantage. Viewers get recommendations they really enjoy, customer retention & satisfaction increases, money comes in. Constantly Improve – One of Netflix’s criticisms is that DVD delivery was often slow. Creating a logistics and inventory management system that receives orders and quickly sends out product, in addition to receiving returns and repackaging for reshipment was key to customer retention & satisfaction. Netflix is still staying current by moving from DVDs to streaming VOD. Competition was Flat-footed – Blockbuster kept the same mentality of a 1985 video rental shop. They held on dearly to their late-fee revenue source, and its high fees and strict enforcement soured customers’ views of the business. The late-80s/early-90s business model put them behind. All they did was copy. In 2005, they finally did away with late fees. In 2009, they introduce Blockbuster Express, a DVD rental kiosk designed to compete with Redbox. By now customers are streaming videos and renting DVDs at kiosks, while Blockbuster is trying to off-load their many stores. Competition Thoughtlessly Expanded – Blockbuster rapidly expanded adding its 1,200th store by June 1990 and 9,000 stores worldwide by 2004 . They wanted to be the biggest. And fast. The filled their stores with not just movies, but video games, candies, and other goods. Unfortunately, all these stores require operating expenses. Operating expenses that where greater than the gross profit (i.e. Revenues – Cost of sales). Also, among many stumbles (which is much too long for this post but I put some references below so you can read to your heart’s content) is they failed to anticipate how media consumption will change. From analog to digital. Fast forward to today, Netflix has a share price of over $400, revenues of $4.37 billion USD, and over 2,000 full-time employees. Blockbuster is bankrupt. However, like most engaging stories, the end is never the end. Dish Network purchased Blockbuster and its remaining 1,700 stores on April 6, 2011 for $233 million and took over Blockbuster’s $87 million in debt and liabilities. Dish now continues to license the brand name to franchise location, and keeps its “Blockbuster on Demand” video streaming service and the “Blockbuster@Home” television package for Dish subscribers. Maybe this strategy to resuscitate a nearly-dead brand sounds foolish. However, so did mailing out DVDs.